Bruce Tittel is Of Counsel with Wood Herron & Evans. 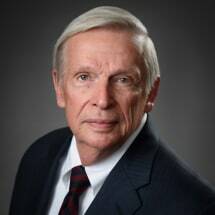 Since joining the firm in 1963, Bruce has concentrated his efforts in the area of patent, trademark, copyright and trade secret litigation and arbitrations. Bruce has served as special counsel for the Ohio Bar Association in an appeal before the Supreme Court of the United States in a trade secret case and as special counsel to the Cincinnati Patent Law Association in an appeal before the United States Court of Appeals for the Sixth Judicial Circuit in a patent license case. He has been lead counsel in numerous cases since shortly after he joined the firm and is currently active in several contested cases. He resides in Cincinnati, Ohio with his wife Rochelle. Speaker on various Intellectual Property Law Topics including Trademarks in Use And Action—Franchising; Patent Enforcement In The 1990’s And Beyond; Selection and Preparation of Expert Witnesses in Patent Litigation; Revisiting The Standard of Obviousness in Patent Cases; and The Impact of the AIA on Patent litigations.